Hey, how about a free eCookbook? 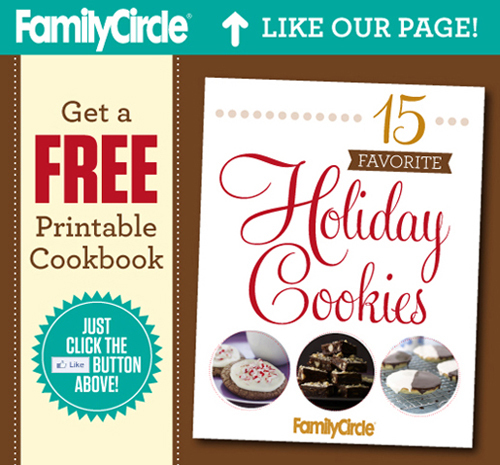 You can download a FREE PDF copy of 15 Favorite Holiday Cookies from Family Circle! All you have to do is ‘like’ their Facebook page HERE! “15 Favorite Holiday Cookies” printable cookbook! Holiday Peanut Butter Cookies, and more! Well, how about a free cookbook? You can download a FREE copy of Signature Family Recipes from Reynolds Kitchens (you’ll have to provide an e-mail address though). Just click HERE to sign up! Delicious home-cooked meals for your family that are specially designed for today’s busy cook. So head on to RedRobin.Com to grab the free cookbook, and be sure to get the 2007, 2008 & 2009 cookbooks (the links are on the right side) while you’re onsite! Thanks to Slickdeals forum member buff_cs for sharing this! BettyCrocker.Com is a great resource for free recipes, and you can download a FREE Best of Betty Crocker Summer 2011 Recipe Book just by right-clicking on this LINK! FREE! Betty Crocker’s Top 25 Recipes from 2010! Pretty cool! Betty Crocker.Com has put up their Top 25 Recipes from 2010 (Betty’s Best Recipes: Year in Review!). You can get all the recipes for free by going to their Best Recipes page. The recipes include: Cheesecake Pancakes, Parmesan-Dijon Chicken, Pink Champagne Cupcakes, Luscious Lemon Cheesecake, Surprise Cupcake Cones, Club Pasta Salad, Grilled Buffalo Chicken Sticks, Key Lime Pie Poke Cake, Oven-Fried Picnic Chicken, Fudgy Turtle Tart, Apple-Pecan Crisp, Buffalo Chicken and Potatoes, Slow Cooker Spicy Chicken Nachos, Spinach and Beef Enchiladas, Slow Cooker Lasagna, Sausage-Cheese Balls, Chex® Muddy Buddies®, Crunchy Onion Potato Bake, Chocolate-Marshmallow Pillows and Baked Spinach Artichoke Dip. Slickdeals member lostit kindly compiled all the recipes into one PDF file for everyone’s convenience (since you have to get them individually from the BC site)! Grab it here! What a great promo from Reader’s Digest and Swiffer! Basically, you can score yourself a FREE cookbook ‘Quick Food: Gourmet Recipes in Just 30 Minutes‘ (that will be mailed to you within 6-8 weeks) from Reader’s Digest right now. The promo is only for US residents and will run until January 17 (or until supply lasts). Say, what? The Tapeña Spanish Wine website offers FREE Spanish and Tapas recipes for download! Since they’re pushing their wines, they also have special recipes by wine pairing! Once the fingerfood of Spain, tapas have evolved to become its own cuisine. From cold dishes to warm, tapas can be served as tasty appetizers or as full meals. However you might serve your tapas, they are sure to encoruage lively conversation and a wonderful atmosphere. So grab a fork, open a bottle of Tapeña, and enjoy these delicious recipes from Tapeña’s kitchen. The new Tapas Recipes include: River Trout with Ham, Smoked Salmon with Dill Cream, Roasted Mussels, Piquillo Pepper Dip, Minted Goat Cheese Spread, Fish Sticks and Parsley Sauce, and many more! You can download PDFs for each recipe of your choice when you click on each dish link. Any tapas bash should begin with a trip to the market for Spanish cheeses, olives, marcona almonds, anchovies, and dry-cured chorizo or good salami. After that, it’s up to you. Choose one of our menus below, provided by Anya von Bremzen’s “The New Spanish Table”, or compose your own. The Spanish Food Recipes include: Asturian Chorizo in Hard Cider, Blue Cheese and Date Croquettes, Crisp Shrimp Pancakes from Cadiz, Canapes with Piquillo Pepper, Anchovy Revuelto, and many more! You can download PDFs for each recipe of your choice when you click on each dish link.